1. 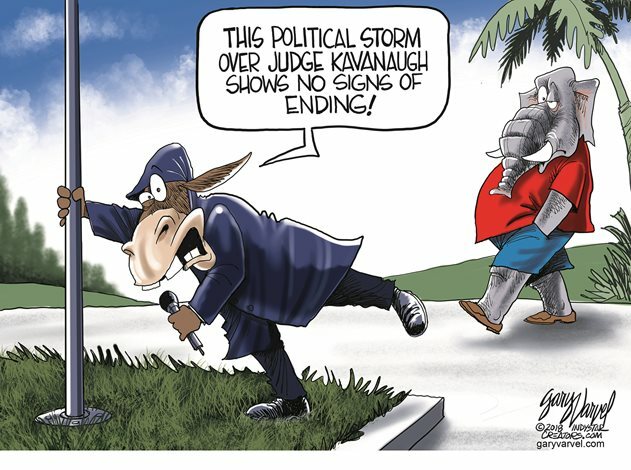 To what recent news item does the first cartoon refer? 2. A cartoonist often uses humor to illustrate a news item. What comic device does Chip Bok use to highlight this news story? Explain your answer. 3. What two news stories did cartoonist Gary Varvel combine to create the second cartoon? 1. A veteran TV weatherman – The Weather Channel’s Mike Seidel – appeared to be caught exaggerating his battle against gale-force winds during Hurricane Florence. Seidel was seemingly battling to stay upright as he filmed a piece in North Carolina – as two pedestrians calmly strolled past in the background. 2. e) hyperbole: An extreme magnification or exaggeration of actuality. It blows something completely out of proportion for a distorted effect. The purpose of hyperbole is to create a larger-than-life effect and overly stress a specific point. (Used as a figure of speech in which exaggeration is used for emphasis or effect, as in “I could sleep for a year” or “This book weighs a ton”). 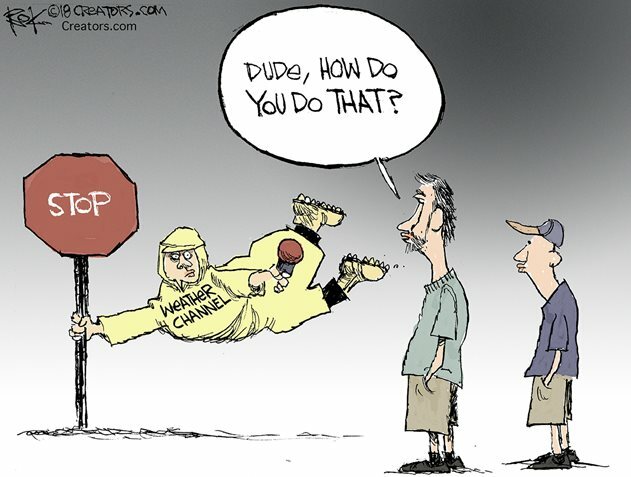 The cartoonist here is greatly exaggerating the Weather Channel reporter’s representation of the strength of the storm while reporting on Hurricane Florence. b) satire – satire is defined as: the use of irony, sarcasm, ridicule, or the like, in exposing, denouncing, or deriding vice, folly, etc. The different view Democratic senators have to Judge Kavanaugh’s confirmation hearings — compared to how Republican senators view the hearings.